Cultural Heritage (CH) outdoor monuments are susceptible to severe and extreme weather phenomena as a result of the climatic change. The prompt detection and analysis, as well as the continuous monitoring of weathering formations and deterioration products is thus crucial for their preservation and longevity. 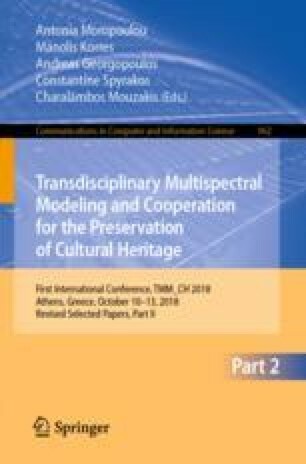 The HERACLES project (HEritage Resilience Against CLimate Events on Site, GA 700395) aims to develop, apply and establish responsive methodologies and systems towards the mitigation of the impact caused by climate changes on the monuments and thus a multi‐disciplinary research is in progress. One of the HERACLES tasks is to develop a diagnostic methodology, which will closely observe the generation and evolution of surface deterioration products on the basis of remote monitoring and mapping and in correlation with environmental data and in-situ characterization of materials. This is implemented by means of imaging spectroscopy which, at specific wavelengths, allows the differentiation of the encrustations from stone substrates. The spectral data, recorded seasonally in‐situ, on the monument, are processed and compared in order to map the spatial evolution of the pathologies. In parallel, in‐situ Raman and LIBS spectroscopic measurements are performed for the chemical characterization of the studied materials, while the environmental conditions are continuously recorded. The acquired data are cross‐correlated in order to elucidate the nature, understand the deterioration mechanism and determine any correlation of deterioration products with climatic changes. The methodology is initially designed on two of the HERACLES test beds; the Palace of Knossos and the Venetian coastal fortress of Koules. Both monuments located in the city of Heraklion, Crete, Greece are representative of important historical eras, involve a number of construction materials and are subjected to various climatic conditions. This methodology, directly connected with the HERACLES ICT platform for responsive monitoring of the studied test‐beds, is envisaged to be broadly implemented in the future to other CH monuments.